Pupils and staff are delighted to have taken delivery of 225 pairs of Shoes That Grow to give to children at Ncemaneni School. The School aims to take the shoes out with them when they go to the RSA in April 2019. Everyone will be asked to take three pairs of shoes each so that they can be given to the children directly. 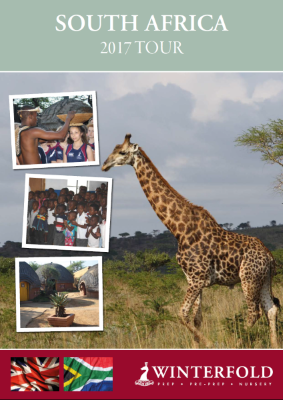 Winterfold has supported Ncemaneni for over 10 years, providing funding for infrastructure projects, including the building of classroom and science blocks. Further funds raised facilitated the installation of piped water at the school for the first time. A truly life-changing event, this meant that the school was able to plant a vegetable garden to supplement their one rice meal a day. I have never been to South Africa. Aside from a very brief visit to a school in Gambia as a ‘tourist’ many years ago, I have never spent a significant time at a school outside of the UK. From an educator’s perspective, our chance to spend nearly two complete days at Ncemaneni School was a golden opportunity, and very much a first for both Mr Brinkley and myself. Now, I could talk about the incredible and quite emotional welcome we had, in which the whole school lined up, waving South African and Union Jack flags whilst singing songs that seemed to fill the hills of Ncemaneni with the strangely mournful yet joyful sound unique to the Zulu. I could write about the assembly that was staged for us, with yet more beautiful singing, incredible speeches of welcome from the learners and the thoroughly intriguing questioning we received about life at Winterfold and in England. However, as an educationalist, I would like to focus here on the day-to-day running of the school; how you go about teaching 46 children in one class, with limited resources and a very prescriptive Education Department breathing down your neck. I can then speak a little of the difference that Winterfold has made, and that we can continue to make in the future. Ncemaneni provides an education for children from reception to Grade 9. With the exception of Grade 6, there is one class for each year group, with an average of 45 children in each class. Year 6 is an unusually large year group of just over 70 children, so this has been split into two classes that now, thanks to a partition, occupy the first new classroom block that Winterfold funded. Grade 8 and 9 are slightly smaller, with around 30 children in each class, but these numbers have increased significantly over the last 10 years. Before then, many children (and especially girls who would leave to marry) left after Grade 7 which meant the end of their education. It is very encouraging to see more learners completing their education at Ncemaneni up to grade 9 and then going on to high school. Winterfold teachers are somewhat spoilt. Teaching classes of between 10 and 18 children is a rewarding and productive enterprise. I have worked in schools where I have had 31 children in a class, which throws up some significant challenges. Teaching 47 Grade 7 children is a completely new experience: I had the opportunity to teach an English class whilst Mr Brinkley taught mathematics. I was expecting behaviour to be an issue, but it wasn’t. The children were respectful and attentive at all times. You might think that this might have been a down to the fact that two strange men from a foreign country were teaching them, but having observed other classes being taught it was a very much the norm. Engagement was more of a problem. Most lessons that we observed contained little interactivity between teacher and pupils; largely it was ‘chalk and talk’. As such, there were usually a group of children who were struggling to engage with the material and little chance for the teacher to check this. The observed lessons were taught at one pace with little or no differentiation, so those struggling were largely left to struggle. This is by no means a criticism; it is just the reality of teaching so many children in one class with limited resources. It is also a reflection of Zulu culture where children have the utmost respect for their elders and don’t question them. This means that children do not often ask questions of their teachers if they don’t understand something. The children also have to struggle with language. Up to Grade 5, all lessons are conducted in the native language of Zulu, with daily lessons in English. As soon as the learners hit Grade 5, all lessons are conducted in English. With English effectively being a second language, and largely not spoken at home, this is a huge barrier to some. It would be like us, at Winterfold, suddenly switching to teaching all lessons in French. I know I’d struggle! Learners start in Grade 1 learning four subjects; Zulu, English, Maths and Life Studies. The latter covers a range of topics including some basic biology and science, but also key life skills. As the learners move through the grades, they take on social science (geography and history) and the sciences. In Grace 7, a new curriculum subject has been introduced which covers practical life skills, basic personal finance, business finance and some economics. Looking at the textbooks, it looked like a great course (that perhaps we should have more of, at an earlier age, in the UK) but the English used was surprisingly technical and advanced. The teacher told me that this was a significant barrier to many children. Before the provision of the new science block, the school was unable to offer higher-level science to Grades 8 and 9. This closed many doors, and meant that many possible career paths were closed to the learners of Ncemaneni – including anything in the medical profession. Now the school can offer the subject, more children are staying on after Grade 7. It was interesting to observe that many Grade 7s, when asked, said that they wanted to become doctors and nurses; not only a reflection on the high esteem that medical professionals are regarded in the region, but also that the aspiration can now be a reality. Resources were better than I thought. The Education Department provides a reasonable number of textbooks, so most classes were able to share one between two. They also had adequate numbers of exercise books. Where they did struggle was on basic stationery; pens, pencils, rulers etc… Principal Mthembu gets the maximum out of the Government funding of RAND 1100 per-child-per-year (approximately £90) but it doesn’t go far enough. Compare this to the £4650 average allocated to each child in the state sector in the UK, and you get a good feel for the challenge facing the teaching profession in rural South Africa. The school currently has four computers for learners, which were donated by a local mining company. Unfortunately, none of them work. The provision of useable IT facilities, and Internet access, would be transformational for the learners of Ncemaneni, especially if twinned with adequate training for teachers to enable them to use them effectively. So, back to my own English lesson. 47 children with relatively limited English who didn’t understand my accent. What to do? After some careful reflection, I decided not to deliver a rousing session on English Grammar, or a critique of Macbeth, but opted for the relatively easy option of writing a letter to the pupils of Winterfold who will be travelling to Ncemaneni next year. After giving them all the name of a child to write to, we then explored as a class what kind of things they might want to write. After dwelling on the subject of cows (how many, names, colours etc..) for slightly longer than I would have wanted, we moved onto what they might write about themselves, and questions that they might want to ask their new ‘pen pals’. I am very much looking forward to our children writing a response! Thanks to all of the fundraising by the Winterfold community, there is now running water at Ncemaneni Primary! The Eshowe Community Action Group was delighted to receive funding from Winterfold for the construction of a science laboratory in Zululand. The Group are happy to report that the building structure of the science laboratory is now 100% complete with sinks, gas, desk, security gates, ceiling board and electricity also installed. Ncemaneni Primary School is 24km away from Eshowe. The Principal, Mr Armstrong Mthembu, has been at the school for more than 10 years. He is trying so hard to improve the school even though it is situated in the rural area. He has been in contact with Winterfold previously and 2 classrooms were donated in 2009. The science laboratory carries the name of Winterfold School as donors on top of the classroom door. The learners will now be able to do experiments during their science lessons, something which was not able to happen previously. Perhaps the highlight for many was our visit to our sister school, Ncemaneni. We were given an incredible welcome with singing and dancing and much of this took place in the Winterfold-Ncemaneni classroom block that we funded and opened a few years ago. Winterfold UK pupils sang “Happy” in return and this summed up the emotion of our visit. Ncemaneni’s Head Girl gave a very moving speech about the difference that the partnership with Winterfold has made to her and the rest of the children’s’ lives, and it was an honour to be able to present Ncemaneni with a cheque for £42,000 (R735,000) to build a Science block. We will open this building on our next tour in 2017 which will certainly be a moment to cherish. Our son had, and I quote, “the best time of his life”. He has been full of stories about what he did, the people he met and the lessons that he learned!